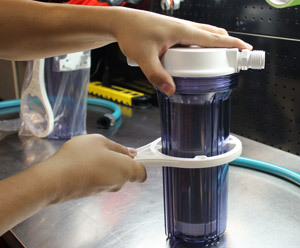 I was able to put it together along with a water softener cartridge in minutes. No more water spots after rinsing my car. I have very hard water where I live (western Chicago suburb) and have always had problems with water spots. The outside spigot on my house isn't connected to our softened water, so it's very hard. I had pretty much given up on washing my car at home. When we bought our new car (a dark blue VW GTI) I really wanted to be able to wash it myself. Of course, the dark color made the water spots really stand out. So I searched online and found this water softener. I thought maybe it would help enough that I could wash the car myself. It works even better than I expected. It virtually eliminates the hard water spots (even on my dark colored car). It's a really wonderful product, and also very well made. I highly recommend it. ConsNot a big deal, but one of the fittings was loose. After I tightened it no problems. Product design has changed. Make sure fittings are secured. This product is a replacement for a canister I ordered several years ago. The worn canister has heavy duty brass fittings that worked as designed. The replacement uses lighter duty brass fittings and the inlet fitting has a twist-style like that found on a typical water hose. 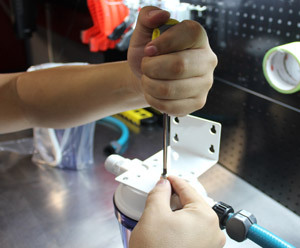 This fitting is quite prone to leaking unless the connection is good and tight; after that, it works fine. The outlet fitting also needs to be heavily tightened. Even after doing that, it has a slow trickle - still not sealed, but not nearly as bad as it was. ProsDoes a great job and is a good design. It's a must if you have severe hard or bad quality water. ConsA change in lighter duty fittings on this product is a surprising draw-back to Autogeek's normally top-notch product line-up. 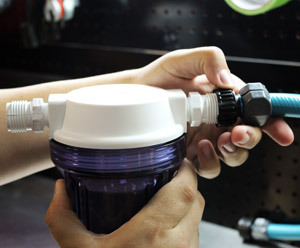 Only issue I had with this product is the inlet connector, you must turn your connecting hose into it, rather than turning the retaining ring on the unit or it will leak badly. California, home to hard water. 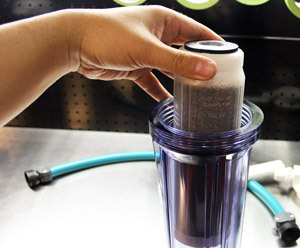 Tired of water spots, I bought the water softener from Auto Geek. Problem solved! It works great. Used P21s auto shampoo (from Auto Geek). As I sprayed the car off, the bubbles took their sweet time coming off, a sign of soft water. No water spots and a great shine. I recommend this water softener to anyone with a hard water problem. I also recommend P21s. Very soft working, never harsh. Beats any other similar product that I have ever used. Thanks Auto Geek!